Download "MERKBLATT PROTECTION FROM TAX LIABILITY. Index: Recht und Steuern"
2 Page 2 of 10 INTRODUCTION Small businessmen and larger companies in particular often have problems dealing with the German tax authorities ("Finanzamt"). This is due particularly to the fact that they know too little about the rules and regulations of taxation and for economic reasons are not able to seek the assistance of a tax consultant. Very often this causes the companies affected to accumulate tax liabilities that can threaten their very existences. The predicament then becomes more than just a financial one and businessmen risk having the local business supervisory office confiscate their business licences following accusations of unreliability as a result of continual tax delinquency. This brochure tells you how these consequences can be avoided. 1. 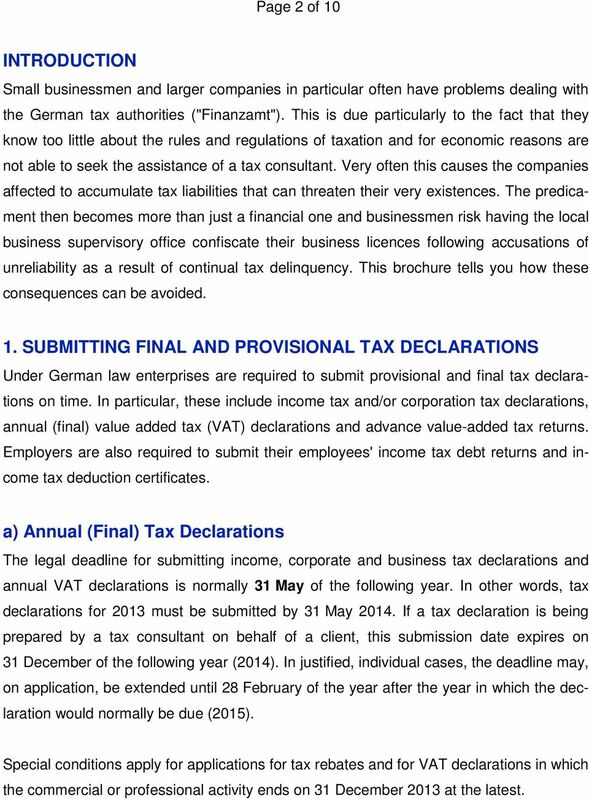 SUBMITTING FINAL AND PROVISIONAL TAX DECLARATIONS Under German law enterprises are required to submit provisional and final tax declarations on time. In particular, these include income tax and/or corporation tax declarations, annual (final) value added tax (VAT) declarations and advance value-added tax returns. Employers are also required to submit their employees' income tax debt returns and income tax deduction certificates. a) Annual (Final) Tax Declarations The legal deadline for submitting income, corporate and business tax declarations and annual VAT declarations is normally 31 May of the following year. In other words, tax declarations for 2013 must be submitted by 31 May If a tax declaration is being prepared by a tax consultant on behalf of a client, this submission date expires on 31 December of the following year (2014). In justified, individual cases, the deadline may, on application, be extended until 28 February of the year after the year in which the declaration would normally be due (2015). Special conditions apply for applications for tax rebates and for VAT declarations in which the commercial or professional activity ends on 31 December 2013 at the latest. 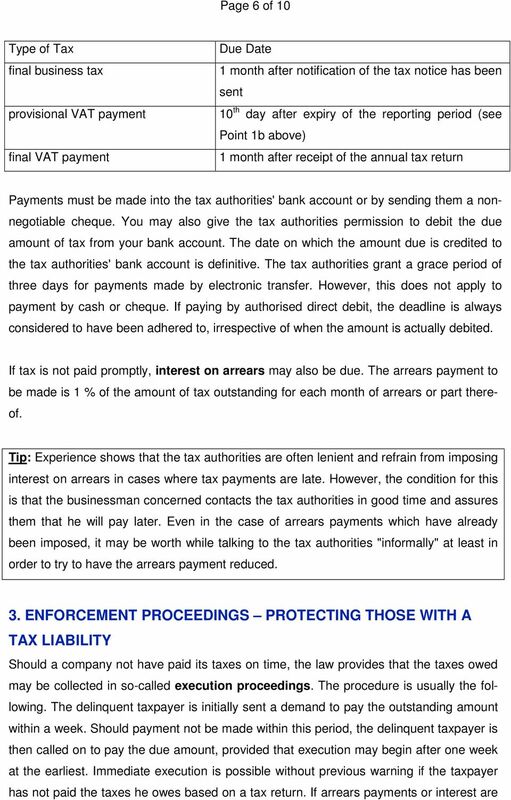 3 Page 3 of 10 b) Advance Value-Added Tax Returns Advance value-added tax returns must be submitted electronically by the 10 th day of the month following the expiry of the declaration period. If the VAT for the past year does not exceed 7,500, the calendar quarter is the declaration period. If, on the other hand, VAT of more than 7,500 is payable for the past calendar year, the calendar month is the relevant declaration period and the provisional declarations are to be submitted monthly. 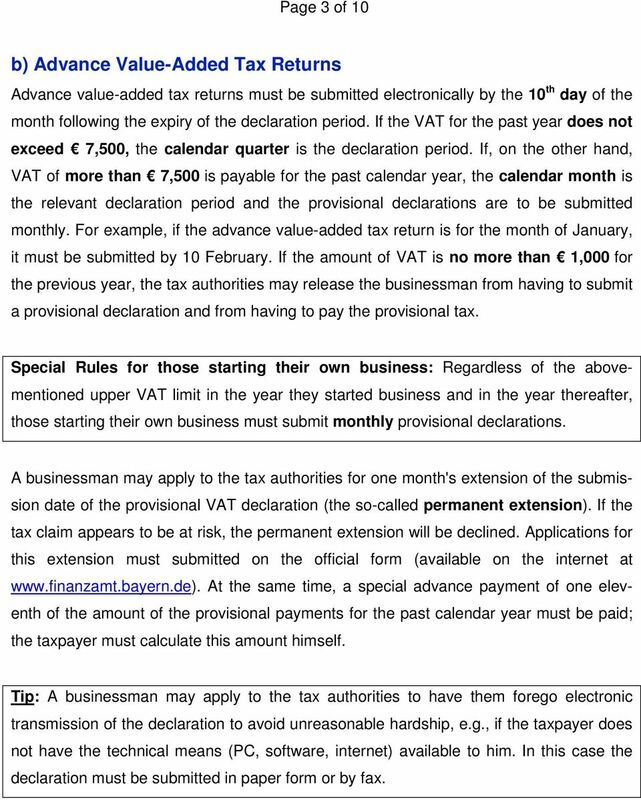 For example, if the advance value-added tax return is for the month of January, it must be submitted by 10 February. If the amount of VAT is no more than 1,000 for the previous year, the tax authorities may release the businessman from having to submit a provisional declaration and from having to pay the provisional tax. Special Rules for those starting their own business: Regardless of the abovementioned upper VAT limit in the year they started business and in the year thereafter, those starting their own business must submit monthly provisional declarations. A businessman may apply to the tax authorities for one month's extension of the submission date of the provisional VAT declaration (the so-called permanent extension). If the tax claim appears to be at risk, the permanent extension will be declined. Applications for this extension must submitted on the official form (available on the internet at At the same time, a special advance payment of one eleventh of the amount of the provisional payments for the past calendar year must be paid; the taxpayer must calculate this amount himself. Tip: A businessman may apply to the tax authorities to have them forego electronic transmission of the declaration to avoid unreasonable hardship, e.g., if the taxpayer does not have the technical means (PC, software, internet) available to him. In this case the declaration must be submitted in paper form or by fax. 4 Page 4 of 10 c) Income Tax Debt Returns / Income Deduction Tax Certificates Income tax debt returns for employees must be submitted electronically by employers by the 10 th day following the expiry of the income tax reporting period. The income tax reporting period is essentially the calendar month, i.e., returns for January must be received by the tax authorities by 10 February of the same year. If income tax on wages and salaries in the previous year are more than 1,000 but less than 4,000, the reporting period is the calendar quarter. In the case of income tax of less than 1,000 for the previous year, the income tax debt return must be submitted annually. A hardship application submitted in paper form or by fax may also be made in this case as well (see above). Employers are required to submit tax deduction certificates by 28 February of the following year at the latest. Income tax certificates of wages since 2009 can only be transmitted with an electronic certificate (via signature card, USB key or software function with signature certificate). Employers without a mechanical payroll accounting system which is not able to issue electronic tax deduction certificates are required to attach a tax deduction certificate to the employee's tax card. 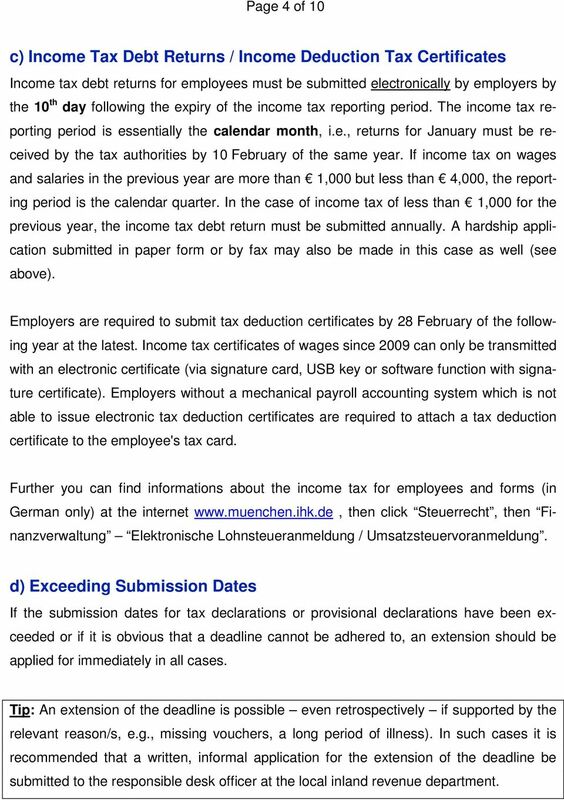 Further you can find informations about the income tax for employees and forms (in German only) at the internet then click Steuerrecht, then Finanzverwaltung Elektronische Lohnsteueranmeldung / Umsatzsteuervoranmeldung. d) Exceeding Submission Dates If the submission dates for tax declarations or provisional declarations have been exceeded or if it is obvious that a deadline cannot be adhered to, an extension should be applied for immediately in all cases. Tip: An extension of the deadline is possible even retrospectively if supported by the relevant reason/s, e.g., missing vouchers, a long period of illness). In such cases it is recommended that a written, informal application for the extension of the deadline be submitted to the responsible desk officer at the local inland revenue department. 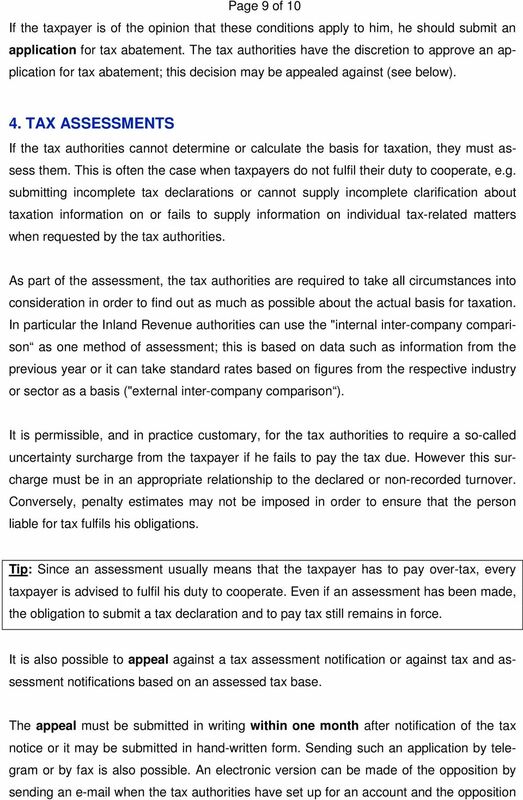 5 Page 5 of 10 If the stated deadlines are not adhered to, the tax authorities are entitled to impose a lateness surcharge. A previous five-day grace period for submissions has been abolished, which means that from now on every businessman is required to submit the relevant documents to the tax authorities. The lateness surcharge may not exceed 10 % of the assessed tax or the base amount and may be no more than 25,000. The imposition of a lateness surcharge is regularly foregone only if failure to pay the tax on time appears excusable. Excusable tardiness may be said to exist in the case of illness or missing documentation (e.g. heating bills). 2. PAYING TAX PUNCTUALLY Besides submitting provisional and final tax declarations on time, it is also important that companies pay taxes on time. In such cases liability arises simultaneously with the due date for payment. This means that the tax authorities may demand payment from the taxpayer when the legal or official deadline expires. The deadlines for paying tax are not uniform; rather they differ according to the type of tax. It should be noted that, for certain types of taxes, advance payments must be made. A few types of taxes with their deadlines have set out in summary form below: Type of Tax provisional income tax (selfemployed, unearned income etc.) 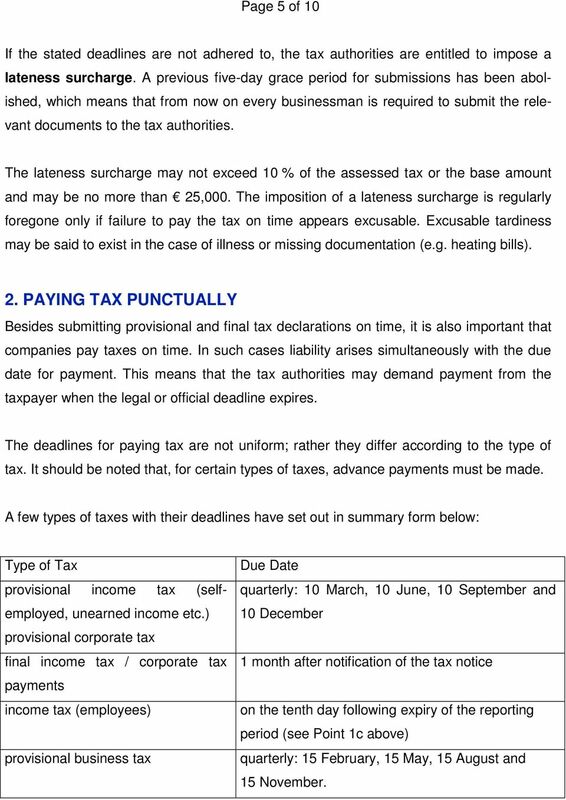 provisional corporate tax final income tax / corporate tax payments income tax (employees) provisional business tax Due Date quarterly: 10 March, 10 June, 10 September and 10 December 1 month after notification of the tax notice on the tenth day following expiry of the reporting period (see Point 1c above) quarterly: 15 February, 15 May, 15 August and 15 November. 7 Page 7 of 10 collected with the tax, no special reminder is required; the same applies to the costs of the execution proceedings. Tip: The taxpayer should not wait until the official who executes the collection order comes to his place of residence or work. It is much better to go to the tax authorities beforehand and try to resolve the matter there. In many cases this can avoid execution proceedings. Ways of avoiding execution proceedings temporarily or completely are shown below. a) Deferred Payment Deferred payment extends the payment deadline. Deferred payment is possible if payment by the due date would mean considerable hardship for the taxpayer and deferral of such payment does not appear to endanger the state's claim. Recognised cases of "considerable hardship" may be personal (e.g. temporary payment difficulties through no fault of the taxpayer, considerable commercial losses due to lengthy illness or natural catastrophe) or of other, more factual nature (e.g. in the case of an expected opportunity to pay with other tax rebates). On the other hand, avoidable payment difficulties, i.e. inability to pay due for avoidable reasons do not constitute considerable hardship. In the view of the tax authorities the taxpayer is generally assumed to be capable of overcoming his payment problems by obtaining a bank loan. Deferred payment is usually only granted upon application and against security (e.g. a mortgage). Interest for deferred payment is charged for the duration of the deferred payment period. The tax authorities can forego the interest, either partially or wholly, if charging it would be unfair in individual cases. The decision as whether to grant deferred payment is made at the discretion of the tax authorities and each case is always subject to verification. 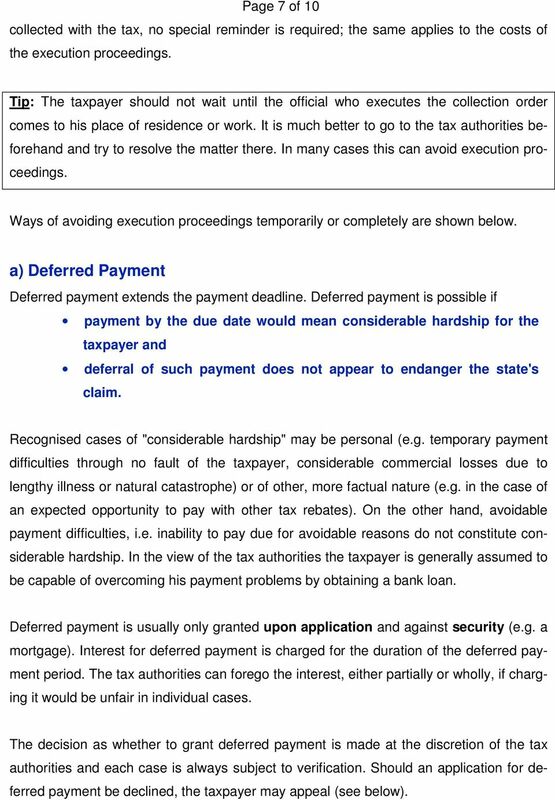 Should an application for deferred payment be declined, the taxpayer may appeal (see below). 8 Page 8 of 10 Tip: The application for payment deferral can and should be made before expiry of the payment deadlines, otherwise the person owing taxes will have to accept that the tax authorities may only approve deferred payment after the application has been received and not in retrospect. Since the person liable for tax must prove that he fulfils the conditions required for deferred payment, he should give sufficient reasons when submitting the application. The reasons can also be repeated. In such cases, the tax authorities must obtain an up-to-date idea of the taxpayer's current economic circumstances. If the tax authorities do not consider the application for payment deferral to be justified, they are obliged to question the taxpayer exhaustively in order to thoroughly clarify his reasons for the application. b) Tax Abatements A further protection against execution is the option of tax abatement, which is only granted in exceptional cases, if the collection of tax would be unfair in individual cases. Tax abatement means that the tax authorities forego the payment of the tax liability, so that the tax debt is extinguished. Amounts already paid may be counted towards the tax liability or even repaid. Strict conditions are attached to tax abatement and circumstances of personal or factual unfairness must exist. Personal reasons of unfairness initially presuppose the need for tax abatement. This may be said to exist if the taxpayer's economic existence is endangered; however, it is also considered reasonable to expect the taxpayer to obtain a loan or to partially liquidate his assets in order to pay the tax debt. As well, the tax authorities require the taxpayer to be deserving of tax abatement. This presupposes that economic hardship is not the fault of the taxpayer and that he has a good record as a taxpayer. 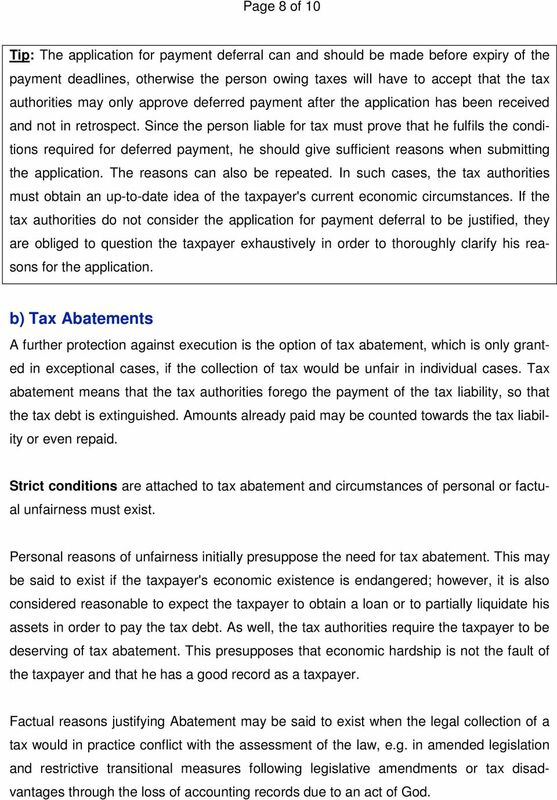 Factual reasons justifying Abatement may be said to exist when the legal collection of a tax would in practice conflict with the assessment of the law, e.g. in amended legislation and restrictive transitional measures following legislative amendments or tax disadvantages through the loss of accounting records due to an act of God. 10 Page 10 of 10 may be edited by you from the present system. Furthermore, in Bavaria can be appealed to ElsterOnline if the taxpayer has set up an account. Please note: Any incompatibilities in the systems used must be remedied by the sender. A document is deemed not to have been submitted until it can be properly read and processed by the recipient. Should the taxpayer not have been informed of his legal rights, the appeal may be generally submitted within one year following issue of the tax notice. There is no obligation to supply reasons for the appeal but it is still recommended that the appeal be supported by evidence. 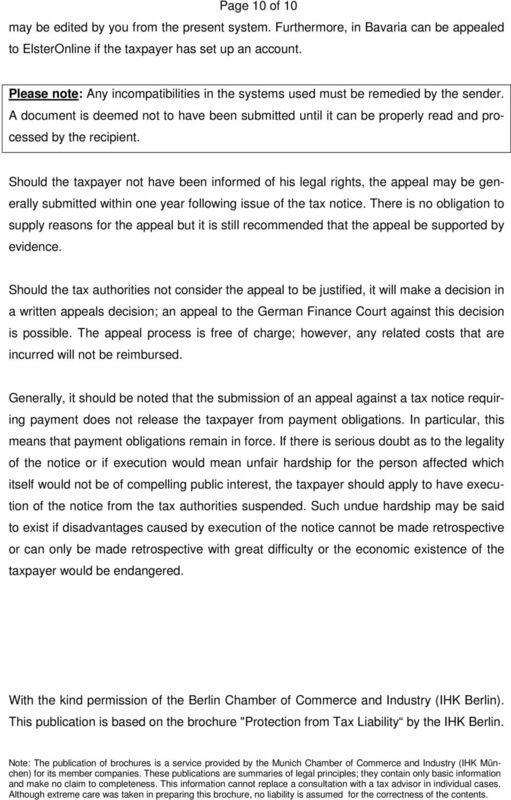 Should the tax authorities not consider the appeal to be justified, it will make a decision in a written appeals decision; an appeal to the German Finance Court against this decision is possible. The appeal process is free of charge; however, any related costs that are incurred will not be reimbursed. Generally, it should be noted that the submission of an appeal against a tax notice requiring payment does not release the taxpayer from payment obligations. In particular, this means that payment obligations remain in force. If there is serious doubt as to the legality of the notice or if execution would mean unfair hardship for the person affected which itself would not be of compelling public interest, the taxpayer should apply to have execution of the notice from the tax authorities suspended. Such undue hardship may be said to exist if disadvantages caused by execution of the notice cannot be made retrospective or can only be made retrospective with great difficulty or the economic existence of the taxpayer would be endangered. With the kind permission of the Berlin Chamber of Commerce and Industry (IHK Berlin). 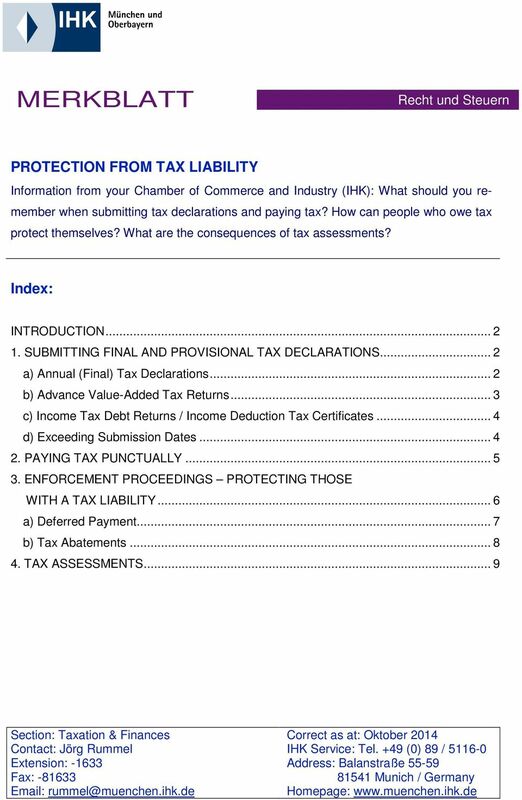 This publication is based on the brochure "Protection from Tax Liability by the IHK Berlin. Note: The publication of brochures is a service provided by the Munich Chamber of Commerce and Industry (IHK München) for its member companies. These publications are summaries of legal principles; they contain only basic information and make no claim to completeness. This information cannot replace a consultation with a tax advisor in individual cases. Although extreme care was taken in preparing this brochure, no liability is assumed for the correctness of the contents. Insurance plans in accordance with the KVG Regulations Version 01.2014 To make the provisions of the contract easier to read, the male personal pronoun is used; these designations also apply to females. Registration contract for domain names under the domain ".ch"
This translation is for reference only. In case of any discrepancy with the original, Dutch version, the Dutch text is decisive.